Lillooet Part of the BC Adventure Network. Over a million web site visitors annually ! 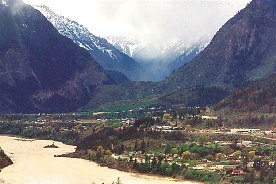 At one time Lillooet was the largest settlement in British Columbia. It's importance is evident in that the Mile "0" Cairn that marks the beginning of the famous Cariboo Trail is placed in Lillooet. Miners and traders used this route to the British Columbia interior and it was vitally important during the Cariboo Gold Rush. 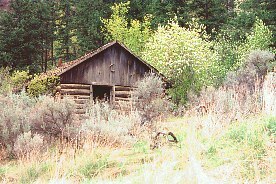 The cairn was used as a measure for all the mile posts to the north; 83 Mile, 100 Mile House, 150 Mile House are examples where communities have grown up along the Gold Rush Trail. Lillooet it situated on the banks of BC's mighty Fraser River, affording visitors a wonderful display of nature's beauty. Those who arrive from the south either by rail or road are privy to some of BC's most awe inspiring sights - everything from roaring river canyons to majestic mountains. Access: Lillooet, British Columbia, is reached from the north by travelling east along Highway 99 from Cache Creek; access through Clinton is also possible along the Pavilion Road which follows the original Cariboo Wagon Road From the south visitors can travel Highway 99 through Whistler and Pemberton to reach their destination. A trip from Vancouver, BC via BC Rail, is a popular way for visitors to experience much of BC's majestic scenery. There is a 3990 ft. paved airstrip available for those with planes. Open daily in July & August. 9am - 9pm Tuesday - Sat. & 9am - 5pm Sun & Mon.